After having come under fire for the collapsed tentage, authorities have decided to leave the Majapahit site open to the elements and instead reinvest the money into building better museum facilities. 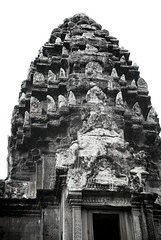 The lack of funds is threatening efforts to save and preserve the remains of a 7th century ship found in Central Java. The ship is the oldest known ship found in Indonesia and possibly Southeast Asia. Any regular reader of this site would realise that the Vietnamese media reports a great deal of the archaeological goings-on in the country. But where do all the artefacts from these various excavations go to? It seems that many museums in Vietnam are suffering from an acute shortage in storage space, to the point that many collections are stored in warehouses. Some artefacts haven’t seen the light of day for over 40 years! The City University of Hong Kong is holding a student forum in January 2011 for postgraduates researching Asian anthropology. Deadline for applications is on October 1!